These are my outrageous camels. I bought them alone – the remainders of a once great (but weird and enormous) manger scene. I passed by the angel that was with them because as I recall, it was creepy. These were purchased at what otherwise would have been the biggest waste of time flee market. 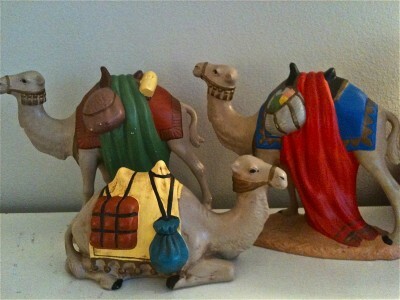 But every year when I get out the camels to park them somewhere in the Christmas decor, I smile and admire them. Absolutely ridiculous. Perfect! 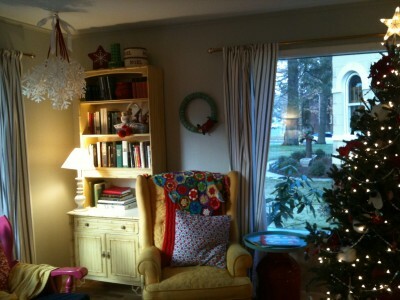 This is a shot of our living room corner – looking holiday wild. Although I always admire places that are sleek and clean and calming, it just doesn’t happen around here! Those enormous snowflakes in the corner have been with us for years. I think this mistletoe ball effect is my favorite way we’ve ever used them. And, I might add, a great use of a former macrame hook. The caramels were a bit of an accident really. I thought I’d make a batch to give away. Then I thought I’d try cinnamon. Then I tried a batch of orange. Those were my favorites. Luke and I are both susceptible to fun in the kitchen, and he perfected his caramel wrapping technique, so we just kept going. Next came a mini batch of kirsch almond cherry (they were fine but not nearly as good as the others, so we called it a discontinued flavor), and finally, we made our own blend that I know will be repeated in years to come – we call it Rockity Road. It is super good. Luke likes it the best. We made another batch. We have started mailing it. We are giving it away to the neighbors. I have everything standing by for lavender caramels. I thought about lime, Luke said not lime. So, instead of working on the things that we need to do, we do things that we don’t need to do. One year it was making homemade Danishes. And that is how we like it. Sticky elbows, late nights, and a big jolly mess. But as for Christmas decorating, this is about my level right now. Throw the ornaments the kids are allowed to play with into a basket on the shelf. Go ahead, let it rip. Let there be penguins on the knobs of things. Let the polar bear be found on the table leg. Invite snowman forts into the tree skirt. Whatever. Just as man was not made for the Sabbath, but the Sabbath for man, children were not made for Christmas decorations, but the Christmas decorations were made for children. If I find the kids have taped a bunch of sketches onto the hall floor, or skootched the couch to accomodate their picnic plans behind it, then I know they feel wanted. When the snowflake clippings seem to be simulating confetti sent through an oscillating fan, I know that they know where they belong. But when the Jolly mess takes you to that place where you are making caramels and have partial candy canes stuck on your socks, don’t forget to look over and wave at me! For what it’s worth I would happily move into your living room for the winter. It’s the coziest, warmest, most inviting thing I’ve seen in a while. Seriously, I want to curl up and knit in that chair with a mug of cocoa on the table and the King’s College Christmas choir on the radio. Only thing I would change would be to put a slew of colored lights on the tree. 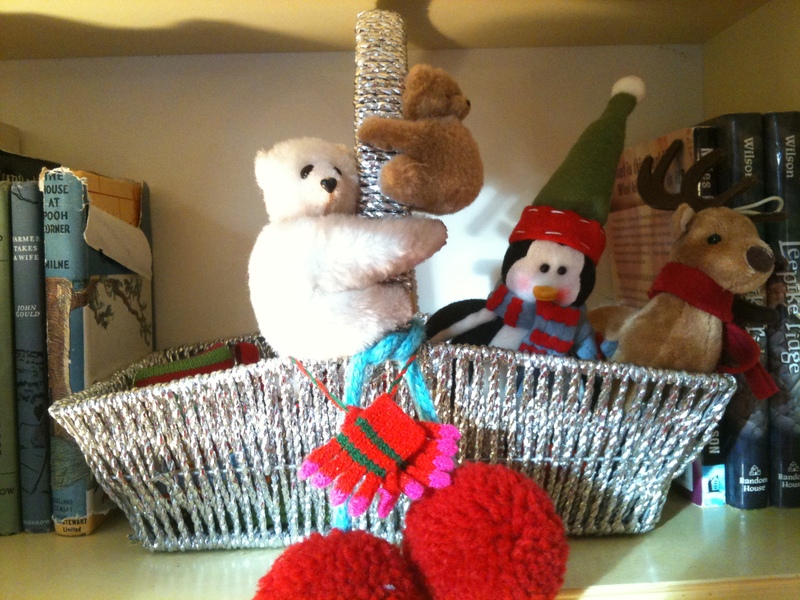 I’m glad I’m not the only person with a basket of very mobile Christmas ornaments — used fluidly for fighting with the castle soldiers, tied to the dog’s tail or chair legs (? what’s with chair legs and string? ), or repelling off the top bunk into a floor swamp…I am glad I am not alone. I do enjoy reading about your “Jolly Messes”, Rachel. And seeing pictures of your darling, cozy home. Merry Christmas! Thank you for sharing! I love hearing about your kitchen experiments! Sounds like such fun! Am I the only one who is dying to know how you made those fantastic caramel labels? The camels seemed so familiar to me and then you mentioned size. My mom used to have a HUGE nativity set that sat under the living room window growing up. I’m pretty sure she painted the set herself. Thanks for bringing back some Christmas memories. What fun! I was attempting to make caramels this year. It was late at night after a LONG day of baking. I don’t have a candy thermometer but I wanted to try it anyway. I burned two batches, was in tears and about to start another when my hubby said “how about we make those another time”. LOL! Now that I’m not so tired maybe I’ll try again! I love the camels. Christmas decorating just isn’t Christmas decorating unless it consists of a few kistchy items that are important because they make their regular reappearance every year! 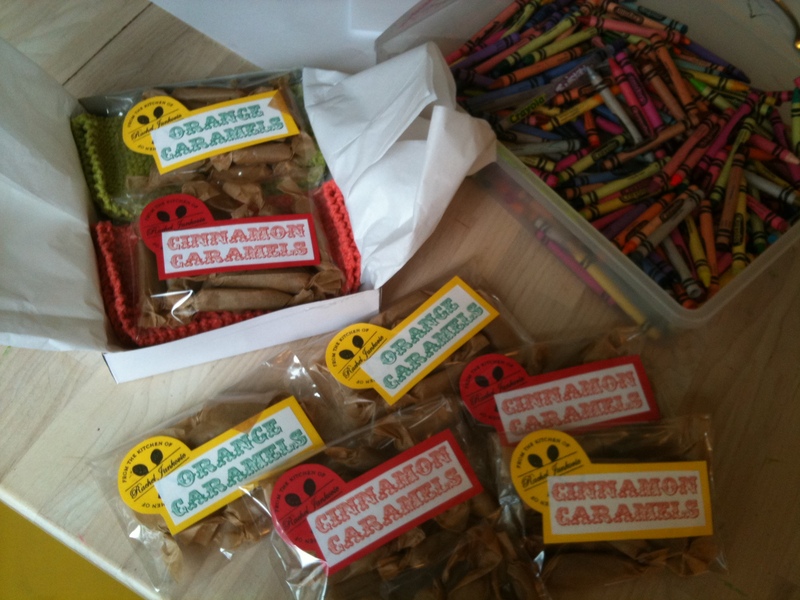 Those caramels are the most awesome thing I have ever seen in my life. Well, that is a little exaggerated but they (the way you pack them, especially) are totally fabulous! And I have to tell you, your Christmas decor seems just so cozy and unique. That’s the way it should be! Totally enjoyed this. And I’m comforted to know that I’m not the only one who ends up spending time doing things I don’t need to do (i.e. starting a new project) the week before Christmas when there’s still so much that I DO need to do. ?